The City of Tarpon Springs is located at the mouth of the Anclote River on the Gulf of Mexico in central Florida. Probably inspired by the tarpon that inhabit the nearby waters, the name Tarpon Springs was given to the settlement that appeared there sometime in the 1860s or 1870s. The Orange Belt Railway, which served as the major transportation route, arrived in Tarpon Springs in 1887, making it a hub of import and export of both people and cargo. And the same year Tarpon Springs became the first city to be incorporated on the Pinellas peninsula. The construction of Anclote Key lighthouse made transportation to and from Tarpon Springs by sea safer. These improvements in transportation made Tarpon Springs a popular winter resort for wealthy northerners in the late 18th and early 19th century. Key West fishermen, in search of turtles, accidently discovered the sponge beds off the mouth of the Anclote River in 1873 when their nets became snagged on them. Spongers from Key West relocated to Tarpon Springs to work the newly discovered beds and some of them stayed, helping grow the community. To process and pack the sponges, sponge-packing houses were built in Tarpon Springs during the 1890s and sponge presses were installed, prompting sponge buyers moved to town. The center of the sponge industry gradually shifted its center from Key West, Cuba and the Bahamas to Tarpon Springs and by 1900 the Tarpon Springs was considered the largest sponge port in the country. The first mechanized sponge boat was brought to Tarpon Springs in 1905 along with five hundred Greek sponge divers from all over the Greek islands. And over the next few years more immigrants followed and new businesses were established to serve the growing Greek community. 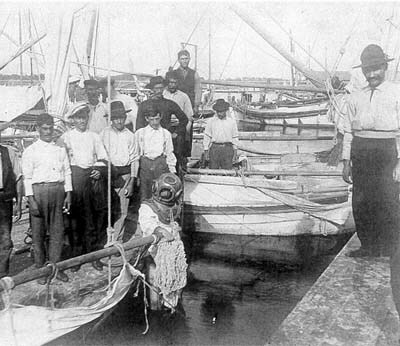 Sponge divers, boat-builders, merchants and brokers all came to Tarpon Springs to live and work, creating a highly-integrated industry. In 1906 the Sponge Exchange Bank was established to support industry activities. And two years later, in 1908, the Sponge Exchange was founded. The Sponge Exchange was an organized system established for grading and selling the sponges. The original Sponge Exchange consisted of storage bins surrounding a central auction block in the center. In 1938 by Michael G. Cantonis founded the Acme Sponge and Chamois Company. At age 21, after borrowing $1000 from a friend, he went to New York and began importing and selling natural sponges from the Mediterranean. To be closer to its primary customer base, the company was moved to Chicago in 1947. And in the 1950s, imported natural chamois and synthetic sponges were added to the product line. In 1959 the company began planning a tannery to tan chamois leather, which was finally opened in 1962. And in 1977, Acme’s facilities were consolidated and relocated to Tarpon Springs, Florida, where they remain today.